Background and objectives: Peripheral arterial disease (PAD) is a known predictor of cardiovascular morbidity and mortality among hemodialysis patients. Although ankle-brachial BP index (ABI) is a simple and reliable test for PAD screening, its sensitivity has been suggested to decrease among dialysis patients. Design, setting, participants, & measurements: We performed a cross-sectional outpatient cohort study to examine prevalence of PAD among hemodialysis patients using duplex ultrasonography of the lower extremity artery. We also evaluate the influence of increased arterial stiffness on impaired accuracy of ABI for PAD screening. Results: Of 315 total patients, 23.8% had PAD. PAD was associated with younger age, diabetes, current smoking, atherosclerotic comorbidities, increased total cholesterol levels, increased triglyceride levels, and lower Kt/V. The receiver operating characteristic analysis (area under the receiver operating characteristic curve = 0.846) showed that sensitivity and specificity of ABI values for PAD were 49.0 and 94.8%, respectively. An ABI cut-off value of 1.05 resulted in the best sensitivity (74.5%) and specificity (84.4%). There was a significant difference in sensitivity of ABI levels <0.9 for detecting PAD among patients in different brachial-ankle pulse wave velocity quartiles. In patients with the highest brachial-ankle pulse wave velocity quartile, PAD was most prevalent (46.5%), and ABI had the highest accuracy in detecting PAD (area under the curve, 0.933). Conclusions: These results suggest that duplex ultrasonography was a useful tool for screening asymptomatic PAD among hemodialysis patients and that the diagnostic value of ABI for PAD was affected by various factors. Long-term hemodialysis patients are at an increased risk for atherosclerotic disorders, including coronary artery disease (CAD), stroke, and peripheral arterial disease (PAD) (1). PAD, which is strongly associated with CAD and stroke, is a strong predictor for subsequent all-cause and cardiovascular mortality in hemodialysis patients, as well as the general population (2,3). Ankle-brachial BP index (ABI) is a simple, noninvasive, and reliable test for PAD screening; the cut-off point for detecting PAD at rest is <0.9 (4,5). Clinical guidelines for PAD recommend ABI as a screening test for asymptomatic PAD of the lower extremities (5–7). ABI has also been reported to correlate well with PAD severity and angiographic findings (8). In addition to its diagnostic value for PAD, an abnormal ABI value is a significant predictor of all-cause and cardiovascular mortality among hemodialysis patients (9). However, ABI has been suggested to be unsuitable for assessing PAD in patients with diabetes, older age, history of intervention for PAD, or advanced chronic kidney disease (CKD) (10–12). In particular, increased arterial stiffness might interfere with ABI measurements and affect the sensitivity of ABI for detecting PAD among dialysis patients. It is important to establish a screening test for PAD that has sufficient diagnostic value and is safe and inexpensive. In this study, we examined the prevalence of asymptomatic PAD among long-term hemodialysis patients, using a noninvasive imaging test, duplex ultrasonography (US), as the reference. We also evaluated the influence of arterial stiffness on impaired accuracy of ABI for PAD screening. We conducted a cross-sectional outpatient cohort study with adult patients recruited from an outpatient dialysis center in Kawasaki City, Japan. Outpatients on maintenance hemodialysis (n = 315) were enrolled. All patients were treated with hemodialysis twice weekly using high flux dialyzers. Patients were excluded if they suffered from malignancy; had any symptom pointing to PAD, including leg pain, intermittent claudication, and skin ulceration; had decompensated liver cirrhosis; or had undergone previous angioplasty or stent placement in a lower leg artery. The study protocol was approved by the Showa University Northern Yokohama Hospital Institutional Review Board. All participants provided informed consent. Blood samples were taken immediately before the hemodialysis session and were stored at −80°C until assay. We performed duplex US to confirm the diagnosis of PAD of the lower limb in enrolled patients. Duplex US was performed by experienced ultrasonographers using AUSCON Sequoia (Mochida Siemens Medical System Co., Tokyo, Japan). PAD was defined as the presence of stenosis ≥50% in any lower extremity artery between the common iliac and femoropopliteal regions. ABI was measured immediately before a hemodialysis session. Patients rested in the supine position for at least 5 minutes until their BP stabilized. ABI was calculated at the ration of ankle systolic pressure divided by arm systolic pressure, in which lower values of ankle pressure were used for the calculation. In addition to ABI, in 274 patients at a single dialysis unit, we also assessed contralateral brachial-ankle pulse wave velocity (baPWV) of the arteriovenous fistula to find a relationship between ABI and baPWV; baPWV is a reliable surrogate marker of arterial stiffness (9,13). ABI and baPWV were measured using Form PWV/ABI (Nihon Colin Co., Tokyo, Japan), which simultaneously measures bilateral arm and ankle BP and pulse volumes of the brachial and tibial arteries with an oscillometric method, respectively (9). Occlusion and measuring cuffs were plated around the upper arm without vascular access and both sides of the lower extremities. In the baPWV measurement, pulse volume waveforms of the brachial and tibial arteries were recorded. Pulse volume waveforms obtained at two different sites were recorded simultaneously to determine the time interval between the initial increase in brachial and tibial waveforms (Ta). The path length from the suprasternal notch to the elbow (Da) was obtained as a superficial measurement and expressed using the following equation: Da = 0.2195 × height (cm) − 2.0734. The path length from the suprasternal notch to the femur to the ankle (Db) was calculated as follows: Db = [0.5643 × height (cm) − 18.381] + (0.2486 × height + 30.709). Finally, the following equation was calculated to obtain baPWV: baPWV = (Db − Da)/Ta. ABI and baPWV measurements were performed once for each patient. Patients were divided into quartiles by baPWV values, and we evaluated sensitivity and specificity of ABI for PAD screening in each subgroup. Results are expressed as frequencies and percentages for categorical variables, mean ± SD, and mean ± 95% confidence interval (CI). Differences between patients with and without PAD were analyzed by Fisher's exact test for categorical data, an unpaired t test for continuous parametric data, and the Mann-Whitney test for continuous nonparametric data. 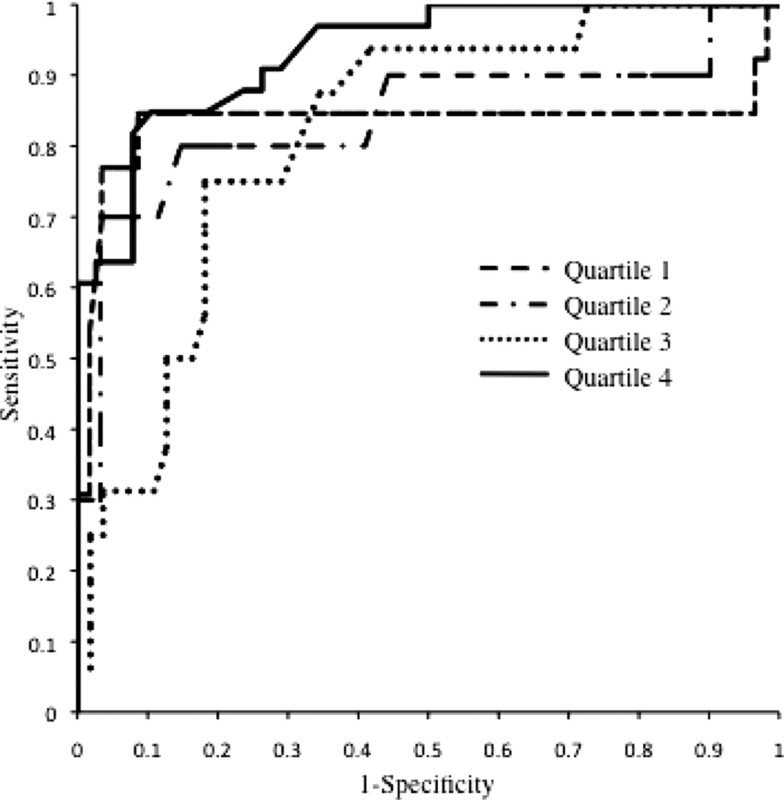 Differences between patients in each baPWV quartile were assessed by ANOVA or χ2 test. P < 0.05 was considered statically significant. The usefulness of ABI in predicting PAD of the lower limbs was assessed by receiver operating characteristic (ROC) curve analysis. The best cut-off was defined on the basis of analysis of the ROC curve by identifying the value of ABI that gave the best combination of sensitivity and specificity. Baseline characteristics of patients are shown in Table 1. The mean age of participants was 60.6 years (range: 28 to 90 years), 32.7% were women, and 31.1% had diabetes. Of the 315 patients included in the study, 75 (23.8%) were diagnosed with PAD based on one or more significant stenotic lesions of a lower extremity artery on duplex US examination. Fifty-two patients had PAD in both legs, and 23 patients had unilateral PAD. Differences in distributions of age, gender, diabetes, current smoking, Kt/V, total cholesterol level, triglyceride level, and history of atherosclerotic comorbidities including CAD and stroke were observed between patients with and without PAD (Table 1). Patients with diabetes and current smokers were significantly more likely to suffer from PAD than those without diabetes or who did not smoke (P < 0.001 for both comparisons). Among the 274 patients who underwent baPWV, 72 patients had PAD and 202 patients did not. Patients with PAD had stronger arterial stiffness than those without PAD, as shown by baPWV (2115.3 versus 1846.8 cm/s, respectively; P = 0.0020). The distribution of measured ABI of 628 legs with and without PAD is shown in Figure 1 (two patients had previously undergone amputation of a lower extremity because of diabetic gangrene or trauma). Of the 75 patients with PAD, 52 (69.3%) had PAD of both legs, and 23 (30.6%) had unilateral PAD. Of the 628 legs studied, 127 (20.2%) were diagnosed with PAD by duplex US. The mean ABI was significantly lower in legs with PAD than those without PAD (0.91 ± 0.23 [95% CI, 0.88 to 0.95] versus 1.17 ± 0.15 [95% CI, 1.16 to 1.18]; P < 0.0001). Although 64 legs (50.4%) had ABI <0.9, 63 legs (49.6%) with ABI ≥0.9 showed significant stenosis of a lower extremity artery. 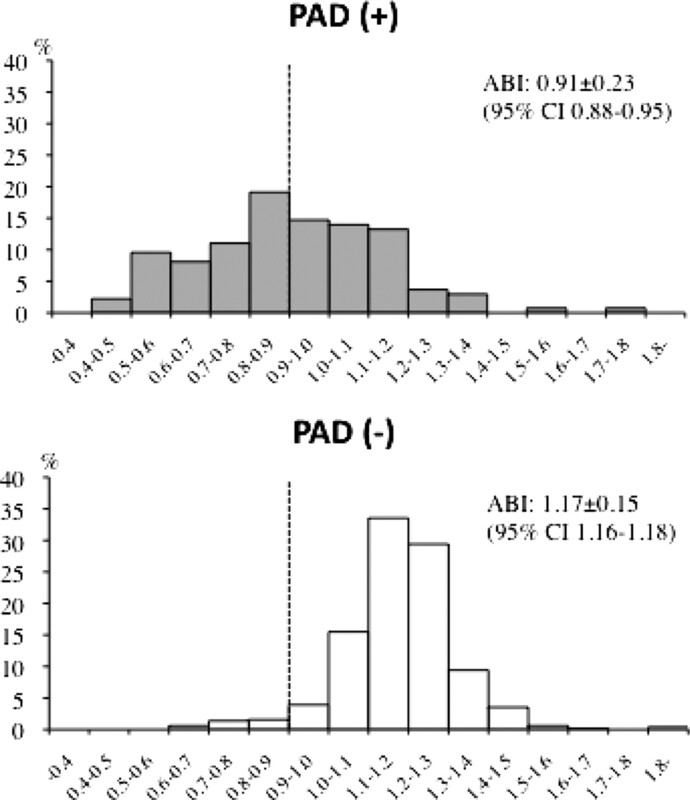 Distribution of ABI in the lower legs among patients with and without PAD. Mean ABI was significantly lower in legs with PAD than in those without PAD (P < 0.0001). Seventy-five patients (23.8%) had PAD. A total of 127 legs (20.2%) were diagnosed with PAD, and ABI of 64 legs (50.4%) was <0.9. Figure 2 shows the ROC curve analysis of ABI for the diagnosis of PAD. ABI had a significant diagnostic value for PAD because the area under the ROC curve (AUC) was 0.846 (P < 0.0001). The sensitivity and specificity of each ABI cut-off value for detecting PAD is shown in Table 2. ROC analysis showed that sensitivity and specificity of ABI <0.9 were 49.0 (95% CI, 40.6 to 57.4%) and 94.8% (95% CI, 92.5 to 96.6%), respectively. If the cut-off value of ABI is <1.05, the sensitivity would increase to 74.5% (95% CI, 66.6 to 81.4%), but the specificity would decrease to 84.4% (81.0 to 87.5%). ROC curve for ABI in predicting PAD in the lower extremities of hemodialysis patients (AUC = 0.846, P < 0.0001). Sensitivity and specificity of different cut-off values are shown, and the best cut-off of ABI is <1.05. The clinical characteristics of patients stratified by baPWV quartile are shown in Table 3. The frequency of PAD was significantly different among patients classified by baPWV quartile (P < 0.0001 for trend). PAD was more prevalent in patients in the highest quartile of baPWV (2186 to 5810 cm/s) than those in the lower quartiles of baPWV. The baPWV value was significantly associated with older age, diabetes, ABI, history of atherosclerotic diseases, and decreased serum albumin and calcium levels. No significant difference in gender or duration of hemodialysis was observed among patients classified by baPWV quartiles. Sensitivity of ABI <0.9 for screening PAD varied across subgroups by baPWV quartile (Table 4). Patients with the lowest quartile, whose baPWV ranged from 800 to 1474 cm/s, had the highest selectivity and specificity for detecting PAD with an ABI cut-off value <0.9 (Figure 3; Table 4). The best cut-off of ABI seemed to be similar across quartiles of baPWV. ROC curves for ABI stratified by baPWV quartile in predicting PAD of the lower extremities (quartile 1, AUC = 0.833, P < 0.0001; quartile 2, AUC = 0.841, P < 0.0001; quartile 3, AUC = 0.817, P < 0.0001; quartile 4, AUC = 0.933, P < 0.0001). When subjects were stratified by baPWV quartile, ABI had a diagnostic value for detecting PAD because the AUCs were 0.833 (95% CI, 0.644 to 0.922; P = 0.0002), 0.841 (95% CI, 0.666 to 0.916; P = 0.0006), 0.871 (95% CI, 0.707 to 0.927; P = 0.0001), and 0.933 (95% CI, 0.880 to 0.987; P < 0.0001), respectively (Figure 3). PAD is more prevalent in patients with advanced CKD than in subjects with normal kidney function and has been considered not only an atherosclerotic disease but also a risk factor for cardiovascular morbidity and mortality among dialysis patients (14,15). Thus, early identification and management of PAD may lead to improvement in prognosis for dialysis patients. Based on this possibility, the Kidney Disease Outcomes Quality Initiative clinical guidelines recommend screening for PAD in all patients initiating dialysis therapy (6). ABI has been shown to be a valuable tool for screening for PAD, and it correlates well with the severity of PAD and vascular imaging (2,16–18). Current clinical guidelines of the American Heart Association and Inter-Society Consensus for the Management of Peripheral Arterial Disease recommend using ABI to screen for PAD (5,7). However, previous studies also suggest that ABI is inadequate to assess progressive PAD in patients with prior intravascular interventions and is less sensitive for detecting PAD in patients with advanced CKD (10,11). Previous reports indicate that sensitivity decreases in cases with extensive calcification or multiple lesions at a distal location (11,19). We performed this study to assess the prevalence of asymptomatic PAD by duplex US among hemodialysis patients. We also studied the influence of increased arterial stiffness on diagnostic value of ABI for PAD using the baPWV measurement as a surrogate marker. In previous studies, PAD diagnosis was based on chart review, physical examination, and/or history regarding PAD. Using that methodology, the Dialysis Outcomes and Practice Patterns Study, a prospective, international observation study, showed that PAD was diagnosed in 25.3% of enrolled hemodialysis patients (n = 29,873) with significant geographic variation; whereas prevalence of PAD was 17.5 to 37.8% in European countries, it was 11.5% in Japan (20). Similarly, the Hemodialysis study reported a PAD prevalence of 23% among hemodialysis patients (1). In previous studies of PAD diagnosed by ABI, PAD prevalence ranged from 16.6 to 38.3% (19,21–23). However, there are no available data on asymptomatic PAD prevalence defined by vascular imaging tests, which are more objective and reliable, among dialysis patients. Angiography is considered the gold standard imaging test in assessing PAD (7). However, there are inevitably angiography-related complications, including pseudoaneurysm, arterial dissection, cholesterol emboli, and arteriovenous fistula, which have been greatly mitigated by technological improvements. Unfortunately, dialysis patients are at higher risk for these complications because of advanced atherosclerosis, increased arterial rigidity, and high prevalence of malnutrition and diabetes. Magnetic resonance angiography and computed tomography angiography, as well as duplex US, are acceptable and attractive alternatives to angiography (7). In this study, 75 (23.6%) of 315 hemodialysis patients without any symptoms pointing to PAD were diagnosed with PAD by duplex US. Duplex US has been reported to be less sensitive than contrast-enhanced magnetic resonance angiography in detecting stenosis in ≥50% in the lower extremity artery (24). However, duplex US is safe, inexpensive, and accurate enough to assess PAD in clinical settings (25,26). Patients with impaired kidney function are at increased risk for gadolinium-associated nephrogenic systemic fibrosis (26,27). In this study, PAD assessed on duplex US was significantly associated with older age, diabetes, smoking, decrease in Kt/V, increase in serum total cholesterol levels, and other atherosclerotic comorbidities. These associations are consistent with previous reports among hemodialysis patients (12,20,26,28). This study showed that asymptomatic PAD was 23.8% in hemodialysis patients recruited from an outpatient dialysis unit. ABI was insensitive for detecting for PAD and missed 49.6% of legs with significant stenotic lesions of the lower extremity artery. The ROC curve analysis showed that sensitivity of ABI <0.9, which has been established as a reliable threshold for PAD screening with high sensitivity and specificity, was only 49.0% (95% CI, 40.6 to 57.4%) and that if the cut-off value was set at 1.05, sensitivity would increase to 74.5% (95% CI, 66.6 to 81.4%). These results suggest that ABI might be unsuitable for assessing PAD among hemodialysis patients. Okamoto et al. (12) previously reported that sensitivity of ABI <0.9 was only 29.9% among dialysis patients using multidetector-row computed tomography as a reference. ABI has been shown to be difficult to interpret in patients with advanced CKD, especially dialysis patients, because of increased arterial stiffness as a result of extensive calcification (11). We focused on the relation between decreased ABI sensitivity for PAD screening and increased arterial stiffness in a subset of our hemodialysis patients. Arterial stiffness was evaluated by baPVW, which is a surrogate marker of arterial stiffness and is associated with cardiovascular morbidity and mortality. baPWV has been reported to increase among dialysis patients (9). In fact, baPVW increased in enrolled patients and was significantly associated with diabetes, older age, and decreased serum albumin levels. PAD prevalence was significantly different among baPWV quartiles. Both sensitivity and specificity of ABI <0.9 were significantly associated with baPWV quartiles, and sensitivity was highest in patients with the lowest baPWV quartile. On the contrary, AUC was greatest in patients with the highest baPWV quartile. It is very difficult to interpret these results unequivocally. Several factors, including aging, diabetes, increased arterial stiffness, and advanced atherosclerosis, are likely to affect the measurement of ABI and baPWV among dialysis patients. In particular, calcified tibial arteries might interfere in the measurement of both parameters. Unfortunately, we did not examine vascular calcification of the lower extremity arteries in this study. We assessed the influence of increased arterial stiffness on accuracy of ABI for PAD screening using baPWV as a surrogate marker in this study. However, baPWV might be not appropriate for accurate evaluation of arterial stiffness among hemodialysis patients, particularly patients that had PAD with significant stenotic lesions of leg arteries. This study showed that PAD, which was defined by duplex US, was more prevalent among hemodialysis patients compared with the general population and that ABI might be unsuitable for detecting PAD in hemodialysis patients, particularly those who are diabetic, are older, or are malnourished. PAD is not only a crucial complication but also a predictor of cardiovascular and all-cause mortality. Early identification of PAD by vascular imaging tests may bring about improvement in PAD management. This study has several limitations. First, we enrolled all patients from a single outpatient hemodialysis center; thus, there might be some selection bias related to community characteristics. In addition, current smoking was more prevalent in this study compared with previous studies. Current smoking plays a critical role in the development of cardiovascular disease in dialysis patients and the general population. Therefore, the high current smoking rate might have affected the PAD prevalence in this study. Second, it is not suitable for duplex US to assess stenotic lesions below the knees. We might underestimate the prevalence of asymptomatic PAD in this study. In addition, although arterial calcification below to tibial artery was likely to interfere in the measurement of ABI and baPWV, arterial calcification was not evaluated systematically in this study. Thus, we could not discuss effects of increased arterial stiffness on diagnostic value of ABI for PAD screening in detail. Finally, there is no available information on whether duplex US findings are associated with cardiovascular risk or survival among dialysis patients. As the present study design was cross-sectional, we were unable to predict the benefits of early PAD screening by duplex US or other vascular imaging tests. Further large-scale cohort or interventional studies are necessary to elucidate whether PAD screening by duplex US contributes to improvement in function and survival among dialysis patients. In conclusion, this study showed that asymptomatic PAD, which ABI could not detect, was prevalent among long-term hemodialysis patients and that duplex US is a useful tool for early identification of asymptomatic PAD. The prevalence of asymptomatic PAD and the diagnostic value of ABI for PAD screening might be affected by various factors among hemodialysis patients.